Bread experiments enable you to bake an even better loaf; it's fun too. For me, as a busy person there are two non negotiables. First it must be a healthy, tasty loaf, and secondly it should be relatively quick; gone are the days when I had hours to commit to kneading and, approaching the last years of life, I'm totally consumed with our food being good for us. This page was last updated by Bernard Preston on 28th March, 2019. Everyone nearing their seventies knows that something will get them, but life is so good that I have no desire to die unnecessarily long before my time, simply because I didn't, or wouldn't eat healthy food. That means the dough must be made from healthy flour; the refined stuff from the supermarket is the right way to constipation, obesity and an early demise. Most of us have a sluggish bowel and so plenty of fibre is vital; I use only 100 percent wholemeal. There are no bread experiments with the non negotiables. But there are many things you can play with. One is when to add the yeast. 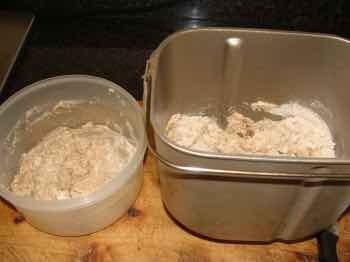 Traditionally, one places the yeast at the bottom of the baking tin, then the flour and lastly the liquid fraction. But recently I've been experimenting with sourdough to make our bread more digestible; the longer the bacteria and natural yeasts are in contact with your wholemeal the greater percentage of the nasty proline is broken down; that's the amino acid in gluten that makes us allergic to wheat. So, try preparing your sourdough without the yeast initially; just on the countertop for a few hours, or even overnight in the refrigerator, and then sprinkle it on top and put the mixture in the breadmachine as usual. There are many different sourdough starters on the web, so you play with them; most use rye flour for the lactobacillus that digests the proline. I like to use raw honey and springwater that has no chlorine. Try a few bread experiments. Secondly, try putting a little more, or less, water in your dough. Too much and it tends to sink a bit, but you'll have a lovely moist loaf; add less and it'll rise better but may be rather dry on the second day. 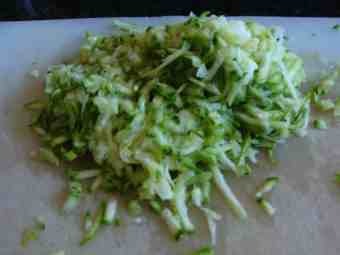 Thirdly, work with different seeds; do grind them first by the way, or they aren't digested in the gut. I always use flaxseed for its high omega 3 content; that's anti inflammatory and important to the chiropractor. Sesame too are a wonderful source of lignans; then you can play with sunflower, poppy and pumpkin, and others. 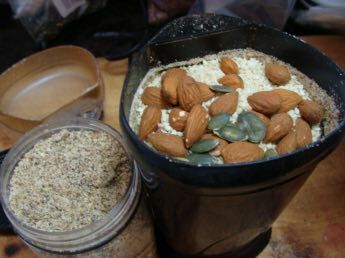 You could grind some nuts into the seed mix too; I like half a dozen almonds, but pecans or any other would do. Preferably freshly cracked as they go rancid very quickly; from a vacuum packed container is okay. If your bread machine has no seed dispenser, try adding the ground seeds after an hour; you'll be surprised at the difference. Are phytates bad, you may be asking? They are natural chemicals found in whole foods that reduce the glycemic index of starches; how quickly they are turned into sugar in the blood stream. Ask any diabetic and they'll tell you how important that is. There are phytates in the wholemeal flour and in the seeds and nuts you add. The lignans help reduce breast cancer and the anti inflammatory omega 3 in flaxseeds is especially important. These whole foods protect the initima of the blood vessels keeping them clean and free from atherosclerosis. Enhance this process with your bread experiments but reduce the effect on mineral absorption. There is a downside though. Phytic acid binds to minerals, particularly zinc, but also iron and calcium, reducing the absorption. This effect is reduced by long soaking in the sourdough mixture. Bread experiments are about fine tuning your baking. If your machine has different times, try both the four and five hour; we prefer the latter. See if adding honey instead of sugar makes a noteworthy difference, and olive oil instead of butter. In fact a little sourcream is lovely too. One of the most important for me is different forms of added protein; that lowers the glycemic index. Homemade hummus is traditional fare in our home; it really makes a green salad, so when it's seen better days the balance goes into our dough. Then you can add different types of fat; I've settled on butter and old cream as favourites as I'm not afraid of cholesterol. With all the salads we eat, ours is dangerously low and some added dairy isn't a fear. You could add milk instead of water, and even beat an egg into the milk. Butter is back and the trans fat margarines are definitely out; bad stuff. Always make it healthy, and keep it simple. Add some chopped herbs, and olives, for example. Rosemary and thyme are my favourites, but sweet basil is great too. 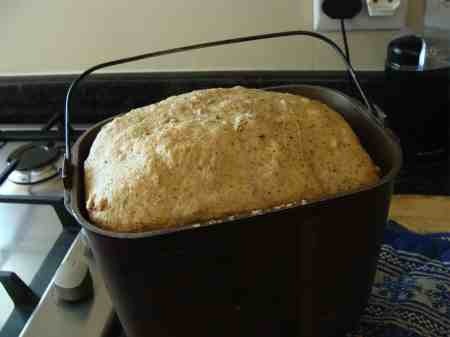 Then you might like to cheat just a little; I add a tablespoon of regular bread flour. True, it's had a lot of the goodies removed, but it makes a less coarse loaf. That makes up only 5 percent of the whole. World standards vary enormously. In the Netherlands bread that is described as whole grain must be 100 percent; but in Germany it's only 90. But in the United States in essence only "50 percent of the grain must be whole grain." And so of course there are many ways you can make bread experiments; it's good to make notes, not forgetting to add the conclusions. There's interesting research showing that dough exposed to the bacteria, and perhaps yeasts too, for a longer period are better tolerated by our colons; the offending proline is better digested. This is just another bread experiment at this stage. Tufts university recommends this loaf that I've taken the liberty to adapt to include sourdough and the bread machine. In your breadmaker oven dish mix half the water, one teaspoon of honey, and let it stand for a few minutes; add half the 100% breadmeal and, using the paddle, mix the ingredients. 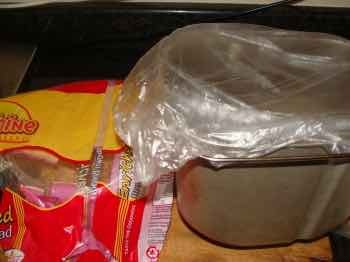 Cover with a recycled plastic bag and allow to stand overnight at room temperature. 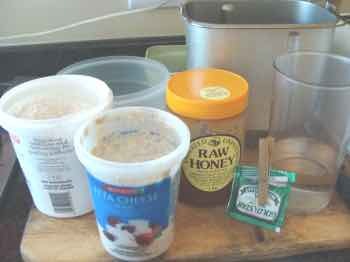 Mix the remaining flour and water, sourdough starter, and a teaspoon of raw honey preferably, in a separate bowl and mix. Again cover and leave overnight. Next morning add the sourdough mix from the second step to your oven dish mixture; then a teaspoon of salt, a tablespoon of butter and another 5ml of honey. Include a tablespoon of homemade hummus to turn it into a low GI loaf. 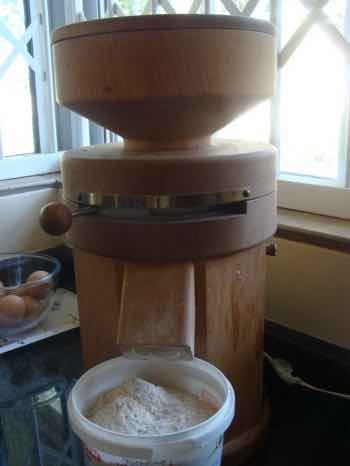 Turn on your bread machine to its normal five hour cycle, not forgetting the ground seeds in the dispenser. The Tufts method is long and involved; I doubt either you or I have the time, healthy though it may be. And I don't believe in baking one loaf of bread in the normal oven; it's wasteful of precious electricity. Their way you'll do only now and then; it's arduous. Mine will take less than ten minutes one day, and three more the next morning; you can manage that daily. Butter is back and, futhermore, researchers at the Spanish Ciberobn centre, using new techiques with biomarkers, say they have conclusively shown that dairy consumption is not associated with increased cardiovascular risk. Update: I follow now a similar process but which is much less labour intensive; I place all the flour and sourdough mixture in the baking dish with the water, and leave it overnight. Next morning I add the salt, hummus and yeast. It's just as good and a lot easier. Healthy flour is one of the non negotiables remember; unfortunately for some bizarre reason, millers are allowed to label their product as wholemeal provided no more than 40 percent of the goodies have been removed; only the best ingredients in your bread experiments. It's not acceptable in my book that the millers can deceive us like that as we want all the bran, and vitamins and minerals, and especially the healthy fatty acids. Don't try such bread experiments; only 100% wholemeal. If you can't get it, seriously consider a wheatmill; they're expensive but ours is twenty years old and perfect. It's used daily without a hiccup. On the subject of grinders, the manufacturer of the old Hawo has come with an upgrade called a Mockmill, using a composite instead of real wood and it's come down significantly in price; now around $350 and the flour is finer than ever. Research published in JAMA reveals that adding smart bran to a refined grain has no value. Low glycemic index bread is vital; whilst your wholemeal loaf, especially with added protein has a moderate GI, the white loaf, rolls and scones are total junk. They cause the blood sugar to soar and that means obesity and the ever-present threat of diabetes and metabolic syndrome; keep them for high and holy days. It's not worth the time and effort to make bread experiments with poor quality ingredients. 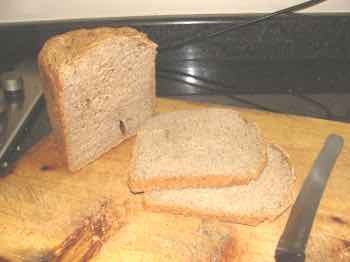 Do your family a favour and make no bread experiments with white flour; they'll love it and want more, but refuse to bake it. I'm in the midst of a series of short stories by women; it's a lovely book of insights into those from Venus. Last night's lament was how the menopause caused her to become grossly obese, just like her mother. But one little dietary tidbit slipped through; they both loved chocolate donuts. They have an extremely high glycemic index; the recipe was designed to undermine the American woman, and it's succeeded spectacularly well. One small experiment has been a great success, and that is to drop a tablespoon or two of our butternut squash soup recipes into the dough; remember to reduce the liquid a little, or it'll sink. It makes for a smoother texture and interesting flavour especially as I like to add a little curry powder. The fat from the coconut cream further lowers the glycemic index. Bread has long given me indigestion and heartburn. I cannot classify this as one of our bread experiments; it happened by chance. I forgot to add the yeast last week. Imagine my surprise when soup for supper demanded a slice of bread, and neither of us had the slightest discomfort. Normally a slice or two and soup for supper is a definite harbinger of a bad night to come. Now we are doing bread experiments with less yeast; my initial reaction is that a heavier loaf with less yeast is giving less tummy troubles. Finally though in these bread experiments and indigestion, I've discovered that reestablishing the normal flora in the colon using these kefir benefits has completely solved the problem. It's still all to be confirmed but I recommend that you too make bread experiments if you suffer from indigestion and heartburn; this easy zucchini bread recipe is yet another. Go from bread experiments to foods that lower cholesterol. I've alternated between using butter and non-deodorised coconut cream and frankly can't tell the difference. Although more expensive, I favour the vegetable coconut. I've yo-yo'd on this subject. Certainly, unless you're a beekeeper yourself, I would use high quality raw honey in your bread; it would ruin it. So I've suggested using sugar in the past. However, my bread rises better with honey, so I'm back to using our best grade, simply because it's all we have. You will have to do your bread experiments; you can get a poor grade from the supermarket, but frankly I wouldn't mess with it; it's such a labile product and so easily adulterated. If you want to use honey in your kitchen, find a local beekeeper and buy a year's supply of raw honey straight from the bottling tank. If your loaf sinks in the centre, try using less yeast; I now use about 3/4 of a teaspoon in our sourdough bread. Bernard Preston loves to bake, and these bread experiments keep it fun; but always it's healthy flour, low glycemic index dough. High GI is kept for high and holy days. For many years I had one bad habit, learned from my Lebanese mother; using sugar with the yeast. Imagine in one of my bread experiments my surprise when, using only honey instead, that the loaf rose so beautifully, and the texture was also much improved. The fungi are also allergic to sugar it would seem. Then he's a semi-retired chiropractor, kept busy every evening, flies gliders on Saturdays and is a layminister in the local church. Remember the body is the temple of the Holy Spirit, says he; don't abuse the dwelling place of Almighty God. In any case it will cause you a lot of pain and cut your life short. The Lord is my chosen portion and my cup; thou holdest my lot. More of our psalms of victory lyrics.